We’re a little late to the party with our Pandemic board game review, but we know there are plenty of gamers out there who want to know if this is THE cooperative game to buy. You’ll already know that we like this game if you’ve seen our Top Cooperative Board Games list, but is it the right game for you? 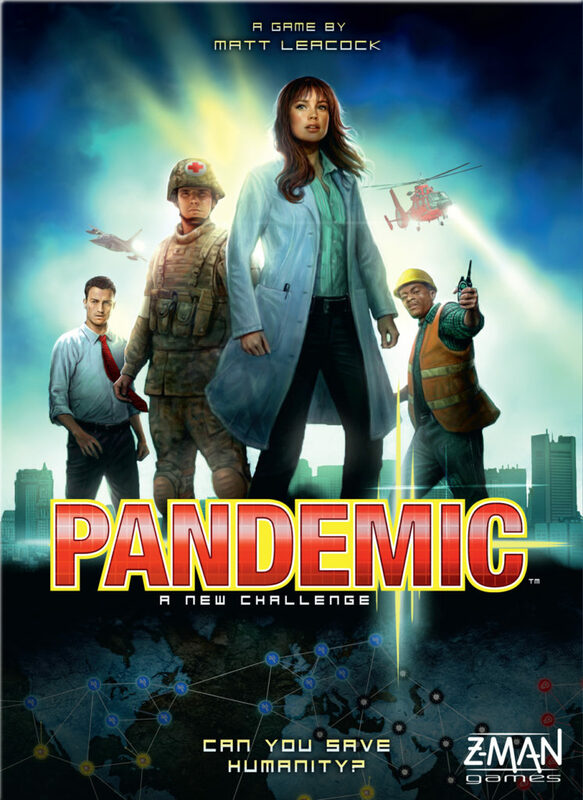 Created by Matt Leacock and published by Z-Man Games, Pandemic is, well… it is all about dealing with a pandemic! Pandemic has players attempt to eradicate four pesky diseases that have broken out around the world, with each disease threatening to wipe out an entire region of people. It is up to the players to deal with the threats before too many people get infected. When playing Pandemic, you are relying heavily on good teamwork, which is what we like to see in cooperative board games. In Pandemic, each player is assigned a randomly selected a role at the start of each game. Players can end up being a dispatcher, a medic, a scientist, a researcher or an operations expert. These roles give players different abilities to use throughout the game. The goal of Pandemic is to work together to stop the diseases from spreading, and to cure them before they get too out of hand. Trust us that this is as tough as it sounds, but that’s not a bad thing. The Pandemic board consists of 48 cities on the map, player cards, infection cards, four sets of cubes to represent the diseases, a pawn for each player, and research stations. On players’ turns, they can move between cities in a variety of ways, share cards, treat diseases, and use their special abilities. The key to each turn is realizing when you should treat diseases and when you should try to get the cards you need to cure a disease. You need to collect five City cards of the same color in order to cure a disease, which usually takes some careful planning. After you’ve done four actions, you will draw two new player cards. At the conclusion of each turn, players draw two new cards and then they will draw a number of infection cards based on the current infection rate. Mixed in with player cards are epidemic cards, which spread the diseases around the globe. Epidemics are horrible because they not only put a city on the brink of outbreaking, but they also add the discarded infection cards back on top of the deck, making it very possible that you will have major issues in the next few turns. Players lose when more than seven outbreaks occur, there are no more cubes of a disease color when needed, or when there are no more player cards to be played. You beat Pandemic if you are able to cure all four of the diseases. 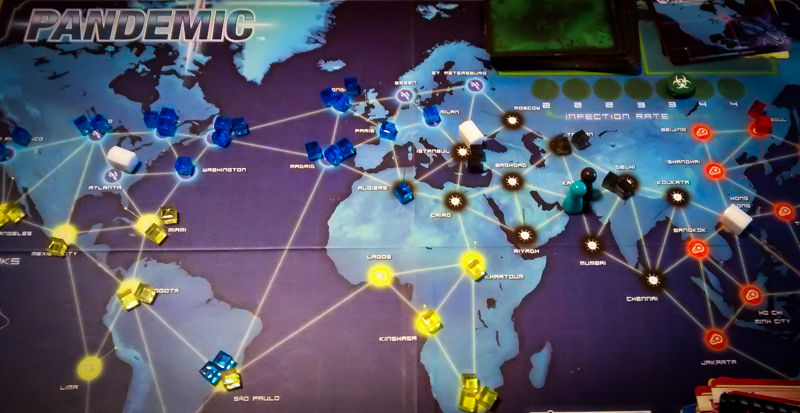 The theme is obvious in Pandemic and you certainly feel it in this game. Diseases spread from region to region in what feels like a very real way, which makes eradicating those diseases feel that much better. All of the roles that players can take on also add to the overall theme of Pandemic. They are the people that we would actually rely upon if diseases really did start to spread around the world. While it may seem complicated, Pandemic is very easy to pick up and learn. It is easy enough to understand to be considered a gateway game, but it is by no means an easy game. If you ever need a quick reminder of what you can and can’t do on your turn, just take a quick glance at the excellent reference cards. The fact that Pandemic is a cooperative game is also a big plus because it turns the intensity up when you’re trying to cure diseases. Most games will go down to the wire, so it’s almost impossible not to be into it. There is definitely a sense of accomplishment when you beat Pandemic with your teammates. The random role assignments at the beginning of each game forces you to come up with different strategies and ensures that game stays fresh through many playthroughs. Trust me, this is not a game you’ll be bored of after a couple of weeks. We also love that Pandemic plays well at all player counts. You can definitely tell that it was made to be a four-player game, but we think it is one of the very best cooperative games for two players. That’s just another reason why it stays on most people’s board game shelves. One thing that you should be aware of if you plan on buying Pandemic is that it is not the best game for younger players. Z-Man games says that it is for ages 8 and up, but it could be quite difficult for an 8-year-old to understand the rules. It could also be a bit too intense for kids. 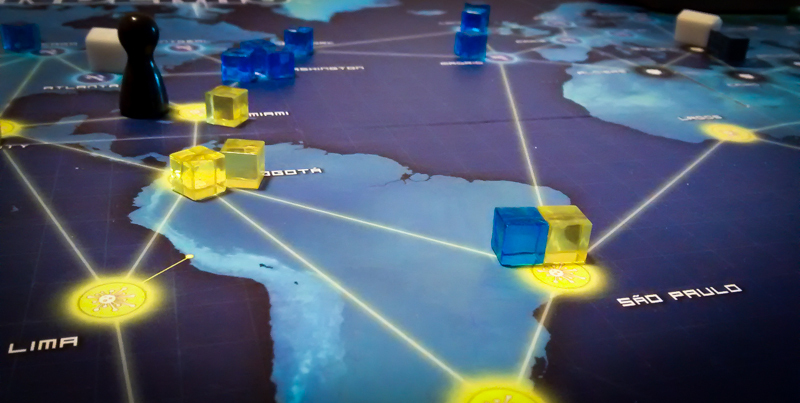 On the overall, Pandemic is one of the best cooperative board games out there. No matter how many times you play it, you simply can’t help but feel like you’ve done something good when you’ve cured a fast-spreading disease. It is no surprise that Pandemic has won multiple awards and that it continues to be one of the most popular board games around. You can also test out the game by getting the Pandemic app for iOS or Android. Thanks for taking the time to read our Pandemic review! To stay updated on all things cooperative board games, follow us on Twitter, Facebook, or via RSS.